Piqua’s Owen Toopes finds the first down marker before being driven out of bounds. 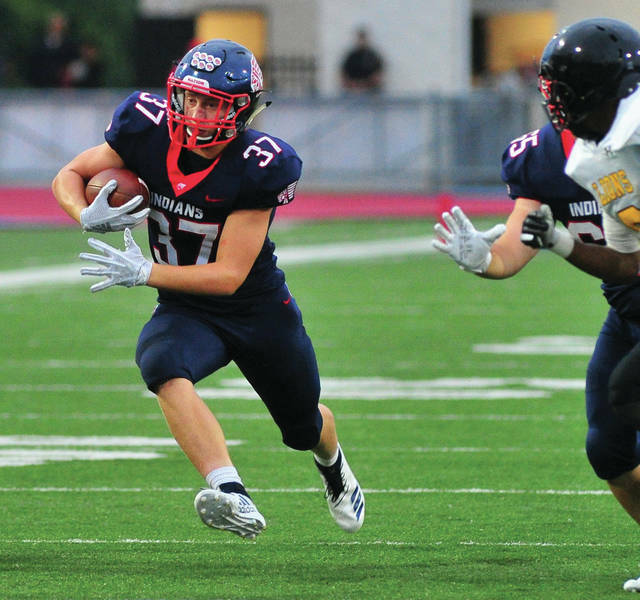 Piqua’s Makeegen Kuhn finds running room Friday night against Meadowdale. Piqua’s Trenton Foster returns a punt against Meadowdale. Piqua’s Grant Toopes pressures Meadowdale quarterback Elijah Carson Friday night. Piqua’s Brennan Toopes makes a tackle Friday night. 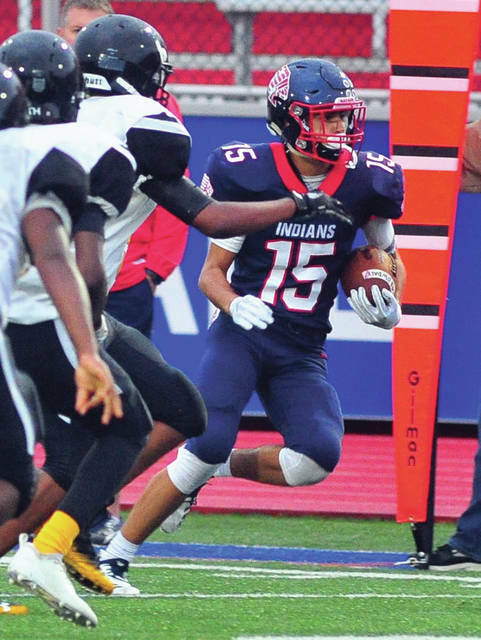 The Piqua football team took care of business Friday night, handling Meadowdale 42-0 to improve to 2-1 on the season at Alexander Stadium/Purk Field. After a Meadowdale punt, Piqua went 72 yards on its first possession to score. Makeegen Kuhn and Mick Karn had 21 yards on consecutive plays and on third-and-one from the six, Kuhn ran the ball in for the score. After the PAT failed, Piqua led 6-0 with 4:56 to go in the first quarter. Meadowdale returned the kickoff to t he Piqua 30, but the Lions could not pick up a first down and turned the ball over on downs. Piqua went 75 yards in five plays with Karn going 55 yards on a quarterback keeper to make it 12-0 with 50 seconds left in the first quarter after the PAT failed. Meadowdale then drove out to midfield before punting. Owen Toopes returned the punt 27 yards to the Meadowdale 45. Four plays later, Karn hooked up with Matt Blankenship on a 20-yard TD pass and threw to Owen Toopes for the two-point PAT to make it 20-0. “They probably had more time of possession than we did,” Nees said about Meadowdale. Meadowdale had to punt from its own seven on its next drive and Trenton Foster returned it to the Lions six. Two plays later, Kuhn ran into the end zone and when Karn ran for the two-point PAT, it was 28-0 with 4:09 remaining in the half. Meadowdale then put a 10-play drive together to close the first half, but Karn intercepted on the final play of the half and returned it 45 yards before being tackled at the Meadowdale 30. The Indians got the ball to start the second half and Colin Roe ran 40 yards from the Piqua 35 to the Meadowdale 25 on the first play after the kickoff. Two plays later, Karn ran 18 yards for the score and his PAT kick made it 35-0. Meadowdale turned it over at its own 35 on downs on its next possession and Piqua scored in seven plays. Piqua had one TD called back for a chop block and another called back for an ineligible receiver, but the Indians still found the end zone. Kuhn had a 20-yard run on the drive and Owen Toopes had a 25-yard run, before scoring from four yards out. Karn’s kick made it 42-0. It was Toopes, a receiver, first two carries of the year. “We put is some new wrinkles on offense and I thought they were pretty effective,” Nees said. 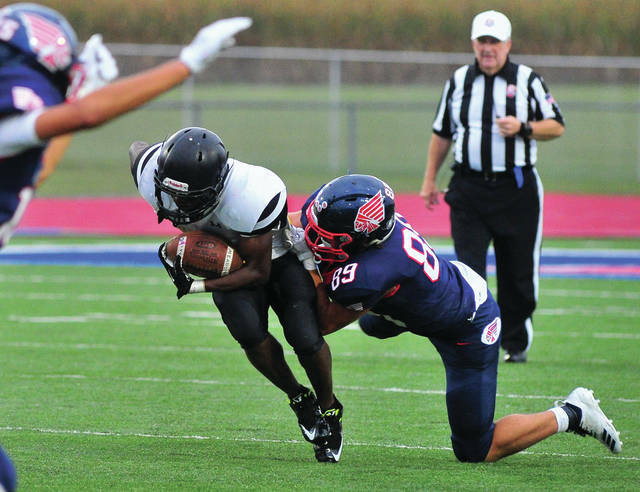 The Piqua defense kept Meadowdale off the scoreboard the rest of the way. Grant Toopes had a strip a fumble recovery deep in Piqua territory to stop one drive, while Owen Toopes had an interception to end another drive in Piqua territory. Karn had 107 yards on seven carries, while Kuhn finished with 81 yards on eight carries. 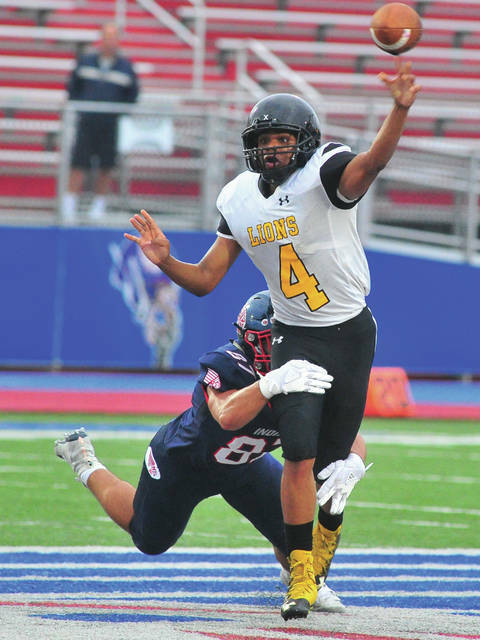 “I thought we distributed the ball to a lot of guys and mixed it up pretty well,” Nees said. 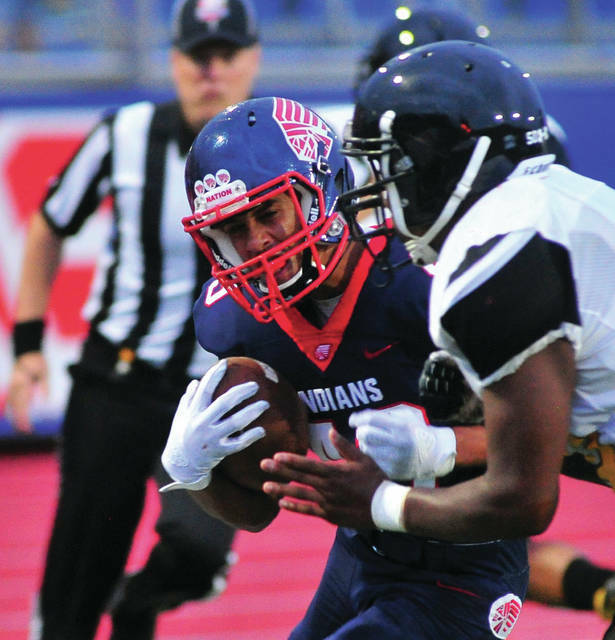 Piqua will look to take care of business next Friday as well — when Fairborn visits for a 7 p.m. game.